As a business analyst, one of my absolute favourite things is running workshops. Stuck on a problem? Let's get in a room and do some activities that will un-stick us. Disagreement on where we're headed? Let's stick 20 feet of craft paper on the wall and duke it out. Need to know who you're building for? You need a personas workshop. Process flow workshops, requirements sessions, governance framework design ateliers, and personas workshops. WORKSHOP ALL THE THINGS. Generally, when I'm preparing for a session, I will spend up to an entire week consulting with clients, building activities, mapping them out all over my office and then walking through them over and over again to make sure they would work. Granted, I'm a bit obsessive, but it's worth it and every single time, I learned a lot. I was doing this often enough that one of my colleagues asked me to run a session to teach people how to run their own personas workshops at Codefest 2014. I put a lot of hours into building this session. All the session materials: the notes, the slides and the even the handy dandy handwritten visual notes (prints on 11"x17" paper - it's pretty much the entire session as an infographic). As with all my presentation notes and the content on this site, I've assigned the Personas Workshop Workshop materials a Creative Commons license (CC by 3.0 non-commercial, see below for details). Feel free to use, copy, share, modify, improve and generally enjoy all of it, with attribution, for personal use. Not for commercial use. 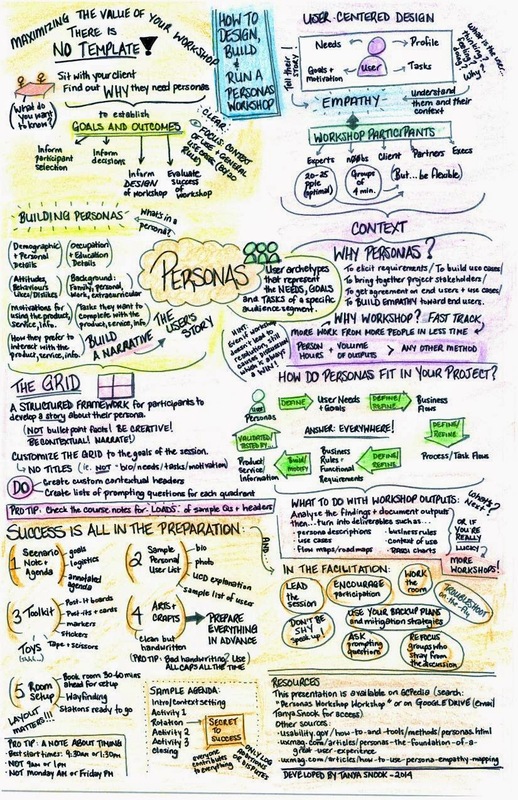 The Personas Workshop Workshop was developed by Tanya S. (@spydergrrl) and is licensed under a Creative Commons Attribution-NonCommercial-ShareAlike 3.0 Unported License. Feel free to re-share, re-use, re-work with proper attribution, for non-commercial uses. This is a work in progress so please come back and let me know what you think, especially if you use it: I would love to know how you changed it and what worked for you. Come back and comment here, tweet me (@spydergrrl) or send me an email [spydergrrlOnTheWeb (at) gmail (dot) com].